Why Did the Air Force's Top Officials at the Pentagon Delay Responding to the 9/11 Attacks? 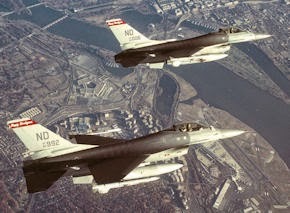 The immediate response to the 9/11 attacks of dozens of the most senior U.S. Air Force officials at the Pentagon who were together in a meeting when the attacks began appears to have been far from what we might reasonably expect, considering the serious and unprecedented crisis the officials had to deal with and the Air Force's key role in responding to it. Evidence suggests that after the first plane crash at the World Trade Center was reported on television on September 11, 2001, there was a delay of over 10 minutes before the officials' meeting was interrupted and the officials were alerted to the incident. The subsequent response of the officials appears to have been slow and lacking urgency. "Thank God that guy's there! Where has he been?" I have watched the Naudet film "9/11" carefully, but never noticed that it includes a clip of the WTC2 collapse that captures a dark smoke plume rising at a considerable distance apparently SW from the towers. No doubt its approximate location can be triangulated by reference to landmarks. The plume does not appear to be industrial exhaust as it is dark grey and has not drifted laterally, but is typical of aircraft crashes. The source of the clip is unknown and may be among the film's credits, but there it is--smack in the middle of this slick Naudet CBS/Paramount production. I link to Raphael's analysis of the Naudet film "9/11" because it is the only place I have seen this still isolated, NOT because I seek to promote his conclusion that the film is evidence of complicity by the Naudets or--more devisively--certain members of the FDNY. MILWAUKEE - Midwest Airlines pilot Gerald Earwood was flying about 100 miles west of New York when he first noticed what seemed like wisps of smoke coming off the World Trade Center. Roughly 15 minutes later, Earwood and co-pilot Eric Fjelstad were frantically maneuvering their DC-9 jet to avoid colliding with United Airlines Flight 175, the second airplane to hit the World Trade Center on Sept. 11, 2001. Their work, following orders from air traffic controllers, saved the lives of about 30 passengers and five crew members of Midwest Flight 7. A minute or so later, United 175 -- which also came close to colliding with other planes that morning -- struck the south tower of the World Trade Center.